KAMPALA – Following the presentation of the report of Parliament’s Committee on Commissions, Statutory Authorities and State Enterprises, which has made groundbreaking recommendations against Bank of Uganda and individuals named in what the MPs termed as “unlawful” closure of some commercial banks, MPs were on Tuesday evening involved in a livd debate, baying for the blood of the officials involved. The MPs, who bashed the out-going COSASE Chairman Mr Abdu Katuntu’s report, saying it did not expressly name the individual culprits, also called for the compensation to directors of the “illegally’ closed banks, including tycoon Sudhir Rupareria’s Crane Bank Ltd and the National Bank of Commerce (NBC) owned by former Prime Minister Amama Mbabazi and friends. Debate returns to the House on Wednesday afternoon, but MPs are calling for the report to be adjusted to name the specific officials to be held liable and then passed on to the Inspector General of Government to prefer criminal charges against individuals named. What is reflected in this report, especially the recommendations, do not match the findings that are written here and also what transpired before the cameras? Madam Speaker, I will just pick a few due to time. It is indicated in the report that the AG is supposed to do an audit of all institutions. If the Auditor General cannot be availed with key documents on the sale of banks, for example, he asked for the inventory report which he couldn’t get. Even the committee in the course of its own investigations was not availed with these reports. Madam Speaker, if you do not have an inventory, what are you selling; and the other person, what are they buying? This clearly shows that maybe there was some dealing between people within BoU and the buyers of these banks. Based on that, I find the findings by the committee and the recommendation that BoU should strictly follow the Financial Institutions Act in the future tense. Really, after finding that banks were being sold without following the laws, people should be held responsible. We cannot sit here as parliament and simply adopt such a report without bringing personalities in this report. If we were in a developed country, people would have resigned. But this is Uganda where corruption seems to the order of the day. For you to come up and say BoU officials who failed to properly execute their duties should be held responsible- who are these officials? Why didn’t the committee name them? I find this report lacking. The IGG is mandated to investigate any acts of omission that could have occurred. This house should refer this report to the Inspectorate of Government so they can investigate and report to this house. Bank of Uganda is supposed to be the custodian of all financial systems, laws regulations and rules. Now that all the rules and financial systems have been abused by Bank of Uganda. Where do we run to next? When you observe irregular, shoddy procurements, lack of record keeping, where do we go? The post mortem is done, what is next? This is my biggest question. These people (BoU) have been hiding within the law because of their independence, I would like to challenge parliament to quickly, through their methods of work to amend, overhaul this law concerning Bank of Uganda so that at least we make sure that all these recommendations as suggested by the committee are put in place immediately. This is the only way we can save BoU, save our economic systems in Uganda; otherwise, if we allow time to go on and the BoU will continue as has been and there will be the remedy to this situation. It is on record that Parliament has never investigated BoU because they have always hidden themselves under the law. As we speak any Uganda who followed this investigation, knows that BoU appears to be naked. I have analysed the report. There has been no report from Bank of Uganda on any closure in 23 years; 7 commercial banks are closed without any reports, including the auditors who audited, no report was availed to them. Whether we like it or not the action of BoU is unfair to these commercial banks. I want to support the recommendations of the committee. If we are saying that names were not mentioned, we need to name names of those responsible. I still remember the name of Bagyenda, I remember the name Kasekende, Margaret Kasule, I remember Justine (Bagyenda) and I still remember Sekabira. These names future prominently from Day 1 of the probe to the last day. 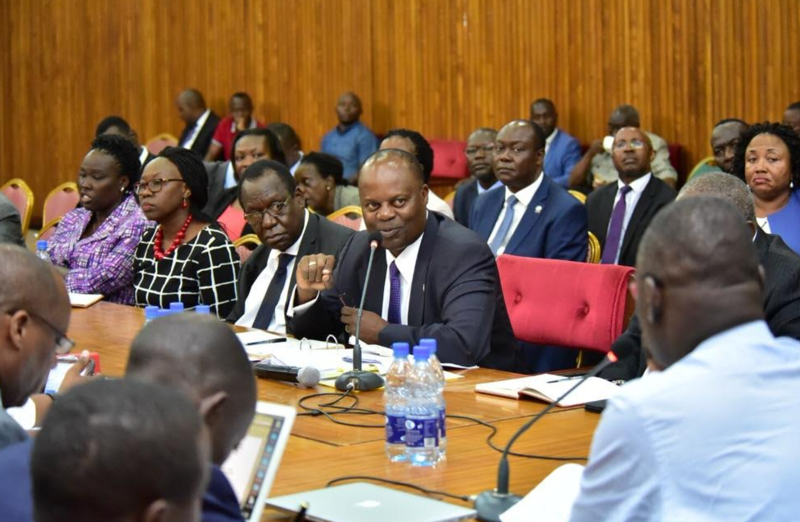 BoU officials who failed to properly execute their duties according to the law should be held liable for the omissions and commission during their work in this process but the committee does not come out specifically to mention. We need to get the names of the particular officials. Even when you say the other institutions should take on we should have somewhere to start from. Who are these names, who are these persons and what are the offices? “Madam Speaker, I am of the view that the loss incurred by the shareholder of these banks must be made good of. The Parliament should take disciplinary action against the culprits at BOU to act as an example for the future generation. We have approved loans but if the highest financial institution in the country has gone to dogs how shall we repay these loans? We have nothing to hide. As we give these names however, we need to be cautious of the case of Fox Odoi v Attorney General”, in which the leadership code was found inconsistent with individual rights in the constitution. We worked under very tough conditions, with limited resources and time before we came up with the report. How do you hold meetings to sell off banks and you have no minutes? We were very angry. How do you get a lawyer of a commercial bank to be a principal adviser of a Central Bank against another bank? We have opened a door that had never been opened before. The commercial banks have been terrorised but had no way out and where to go. The Director Bank supervision was a demi-god.